Student of B'hala, the lost Bajoran city. 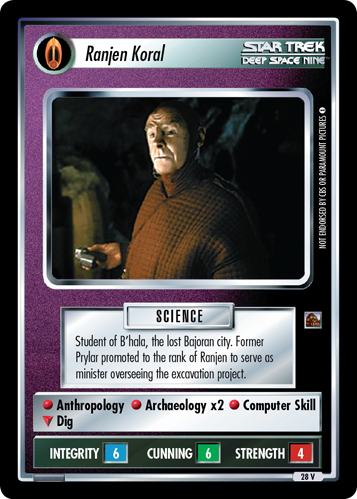 Former Prylar promoted to the rank of Ranjen to serve as minister overseeing the excavation project. Characteristics: "Reshape the Quadrant"-related cards, affiliation, Minister, Prylar, Bajoran species. If you play OTF this card replaces the backward compatible 2E card Ranjen Koral, Student of B'hala from Second Edition - ST1E compatible (the 2E card is no longer valide in OTF).